Pockets with two holes to fit these stands are available in two sizes.Click Here. 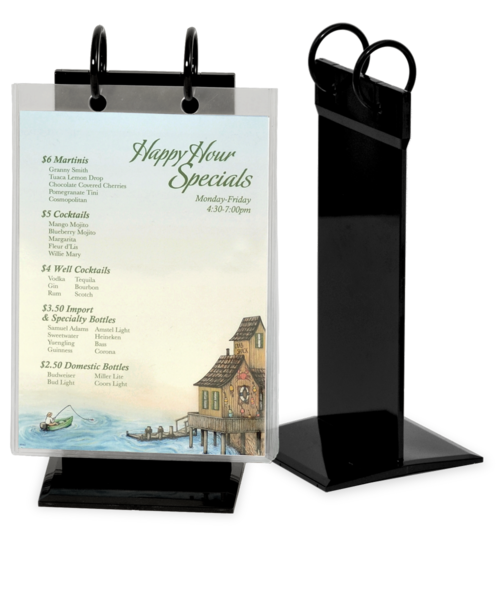 Shiny, black acrylic, table top menu holders comfortably holds up to twenty-five laminated cards or clear vinyl sleeves. Stands are 9 in. high with a stable, 4 in. x 4 in. footprint. Rings are permanently welded to 1/4 in. thick plastic walls to make this stand practically indestructible as well as easy to clean. Use our clear vinyl sleeves with two holds that hold either 4 in. x 6 in. or 5 in. x 7 in. display cards, or laminate your own cards, punch two holes and skip the sleeves. Stands shown holding a dozen of our 'clear plastic sleeves'. 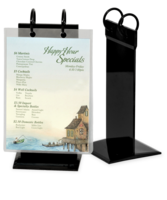 Shiny, black plastic, table top menu holders comfortably holds up to twenty-five laminated cards or clear vinyl sleeves. Shop online with the Menu Shoppe today.